This plant leaves are used to manufacture bidi i.e. vernacualar cigarette .it is very common in Betla park(,famous for tourism and tigers) and also be used as show plant. It is a medium size tree which is extremely drought resistant. Bark is used to make fiber. Flowers are inconspicuous. The dried bark is crushed and decoction is prepared with it and given for glandular infections. The decoction prepared by the bark is used as an external wash for skin diseases and ulcers. The flowers are used to prepare decoction and given for heamorrhagic conditions, plies and cough. The decoction prepared by the roots are used for abdominal disorders. Asmantak or Bauhinia racemosa Bark Extracts, has very potent anti-inflammatory anti-pyretic action. Asmantak or Bauhinia racemosa Bark Extracts have been used in traditional folk medicine to treat numerous diseases. Asmantak or Bauhinia racemosa Bark Extracts are a natural alternative to commonly used anti-inflammatory drugs like Dolonex (Piroxicam), Brufen (Ibuprofen) and Voveran etc. 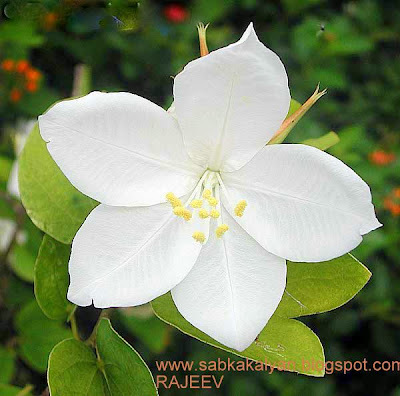 Asmantak or Bauhinia racemosa Bark Extracts can be used with confidence for treating Fever. Directions For Use: Boil 50 gms of Asmantak or Bauhinia racemosa Bark in 250 ml of water for 30 minutes. Strain and drink the Asmantak or Bauhinia racemosa Bark Extracts twice daily for three days. The symptoms of fever are reduced in a day and complete relief is afforded using Asmantak or Bauhinia racemosa Bark Extracts. Not To Use With: No specific precaution needs to be followed while using Asmantak or Bauhinia racemosa Bark Extracts to treat Fever. Side Effects: None are seen with Asmantak or Bauhinia racemosa Bark Extracts. Asmantak or Bauhinia racemosa Bark Extracts can be used with confidence to treat fever. Expected Results: The symptoms of fever are reduced in a day and complete relief is afforded using Asmantak or Bauhinia racemosa Bark Extracts.